I love when friends come to visit! One of my girlfriends and her four-year-old daughter are staying with me for a long overdue girls weekend. Yes, they are staying with me in my tiny studio (to be fair, they are staying and I am crashing at the boyfriend’s place nine blocks away). Living in the city, most friends are interested in experiencing the sites and scenes this amazing town has to offer. Here are a couple of things I like to have to prepare them for the big city. Buy a travel guide to keep at your house. I mark all the places I love, and lend it to my friends when they visit. This is great if you have guests who will be exploring on their own while you are stuck in the office. For New York, I like the Lonely Planet Encounter Travel Guide version. It is small, includes maps, and for $10 you can’t go wrong. 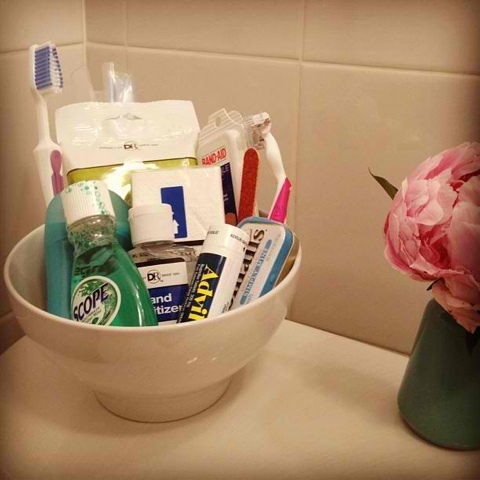 Tourist Survival Kit and Basic Toiletries: place in a bowl or tray in the bathroom. Include a small ziplock bag so your guests can take what they need with them during the day. Some basics to have in case your guests forgot to pack them.